You'll never order Mexican take-out again after you try the recipe below. It's just as good as anything you can get at a restaurant, for a fraction of the price. 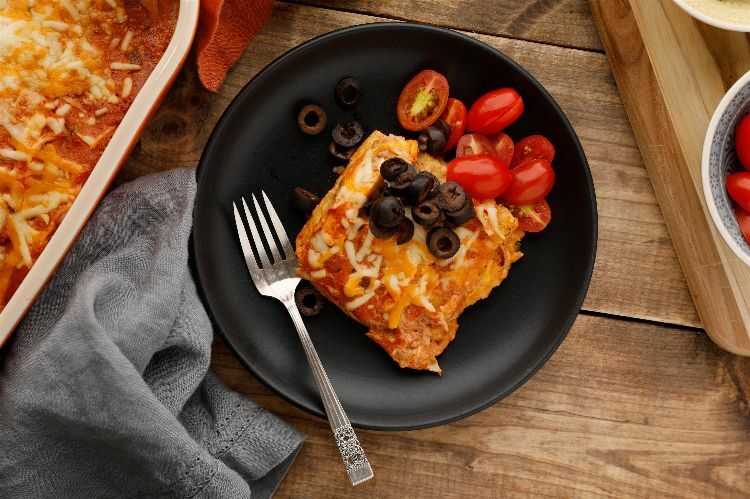 Not only that, but this cheesy chicken enchilada casserole is quick and easy to make, too. Who doesn't love a one-pan meal that's ready in 30-minutes? It really makes cleanup a breeze, so you can spend time with your family at the table instead of time cleaning the kitchen. We love using chicken in this recipe because it tastes great and it's healthy. I almost always plan this meal the day after buying a rotisserie chicken or making a batch of shredded chicken in the slow cooker. It's the perfect way to use up that leftover chicken. If you're want to make this recipe vegetarian, swap in a can of black beans for the chicken or consider adding tofu. The tofu will soak up all of the flavor of the enchilada sauce and become very flavorful. Grease a 9-by-13 baking dish with nonstick spray. Layer 6 of the corn tortillas along the bottom of the dish and set aside. 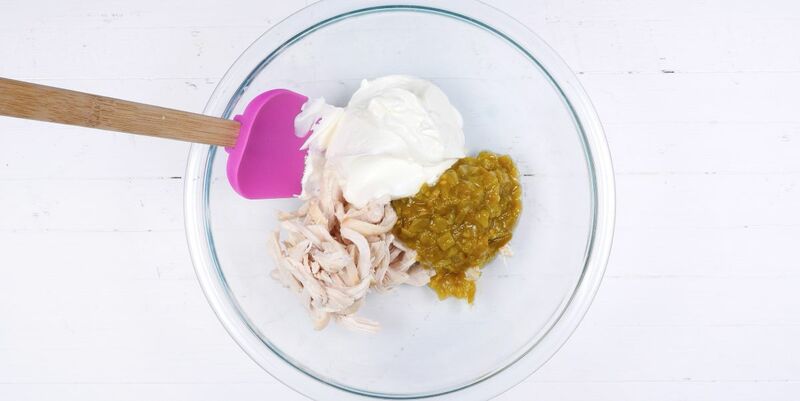 In a medium bowl, combine the chicken, green chilies, sour cream and enchilada sauce. In a small bowl, mix together the Monterey jack and cheddar cheeses. Add half of the chicken mixture to the baking dish, spreading it out so it completely covers the corn tortillas. Top it with 1/3 of the cheese mixture. Add 6 more tortillas on top of the cheese, followed by the remaining chicken mixture and 1/3 of the cheese. Finish the casserole by layering the remaining 6 tortillas and the remaining 1/3 of cheese on top. Bake for 30 minutes, until the cheese is melted and the mixture is bubbly. Allow the casserole to sit for 10 minutes before slicing. Serve each slice with optional garnishes, such as shredded lettuce, tomatoes, olives or salsa.